Marriage can be scary at the best of times. Regardless of wondering whether this is the person you’re supposed to spend the rest of your life with, there are so many other things to worry about too. And while most people worry about the flowers or the table settings because they’ve only got one chance (hopefully) to get it right, one guy has decided to cover all bases and offer his fiancé as much choice as possible. It’s always risky business choosing a ring your partner will theoretically wear for the rest of their life. What if that person is too polite and, after accepting the ring, just tries to ignore the fact they don’t really like it? Dennis Brown, however, has thought of a way around this. Instead of getting down on one knee and presenting his girlfriend with a ring while popping the question, he popped the question with six! 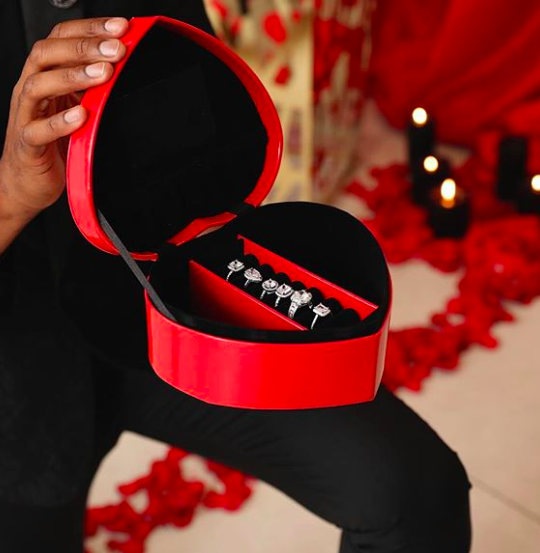 The doting boyfriend opened up a heart-shaped box with six rings in it so his girlfriend, Atara Dallas, could choose which one she liked best. On the other hand, can too much choice be detrimental? Will Atara be living with FOMO every time she looks at her finger now? Told you there are many things to worry about when getting married. Of course, if you’re going to propose with six rings, you’re going to make it a special day. 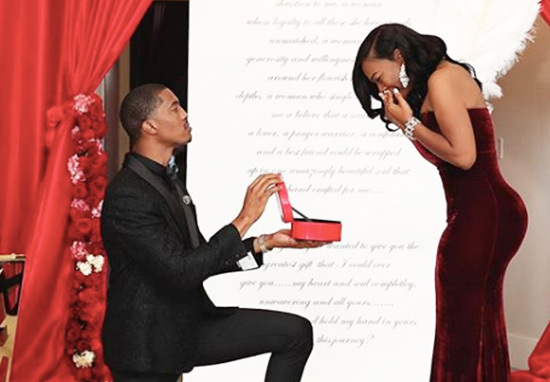 So Dennis, a model and fitness enthusiast, hired an event planning firm, a professional photographer, a florist and stylist for his lavish proposal. Behind a red curtain, Dennis had also made up a large banner, on which he’d printed a touching message to his bride-to-be. Today, on your special day I had the pleasure of putting a smile on your face all day. For there is no greater gift that I could think to give you. A woman, whose heart is full of love and devotion to me, a woman whose loyalty to all those she loves stands unmatched, a woman whose generosity and willingness to help others around her flourish knows no depths. A woman who single-handedly made me believe that a soulmate, a lover, a prayer warrior, a confidant and a best friend could be wrapped up in one amazingly beautiful soul that was handcrafted for me. That’s why today I wanted to give you the greatest gift that I could ever give you… my heart and soul completely, unwavering and all yours… will you accept and hold my hand in yours through this journey? Luckily, Atara isn’t the type of person to shy from such an overt public display of affection, and said yes. She chose the teardrop-shaped engagement ring, in case you were wondering.